Are you ready for Summer? 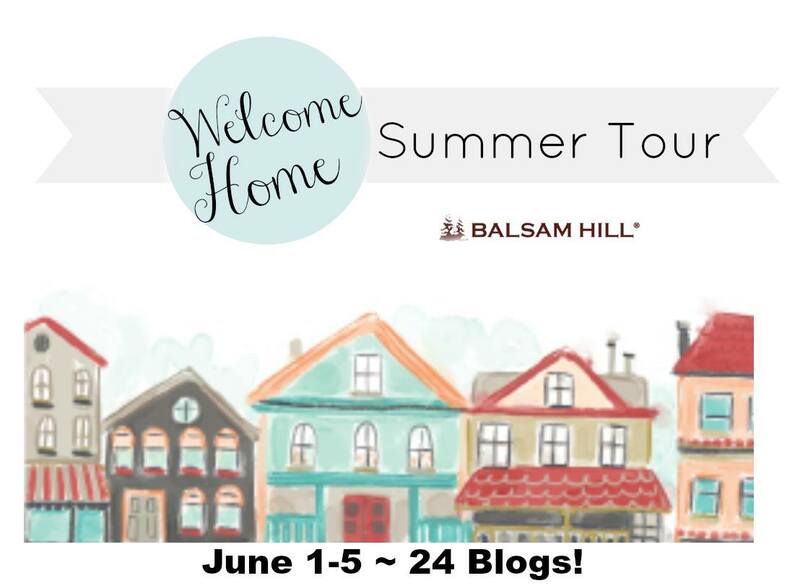 My house sure is and today I’m sharing it with you as part of the Balsam Hill Welcome Home Summer Tour! The generous people at Balsam Hill allowed us to choose something to use as part of our tour, and I’m excited to show you what I picked! Let’s start outside, shall we? This is a little courtyard area you walk through to get to the front door. 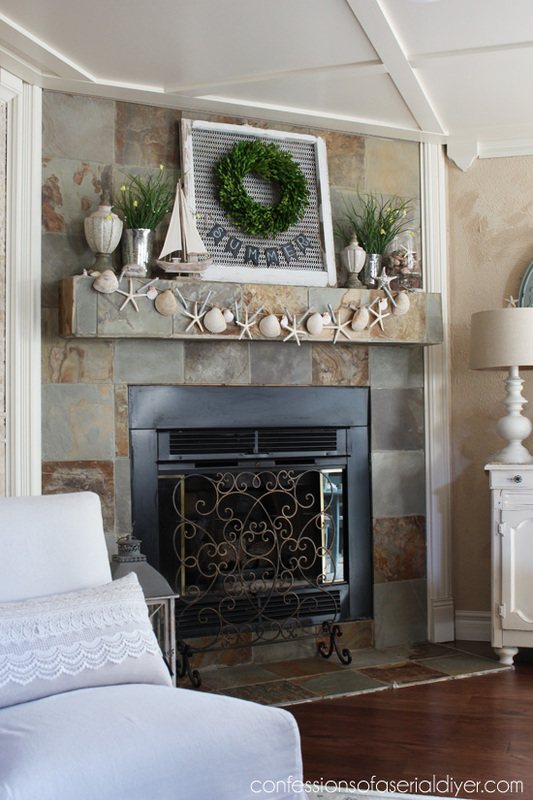 You might remember my new Pottery Barn Inspired Shell Wreath waiting there to greet you! As soon as you enter, you’re looking right at my stairwell. This is the most shared space on my blog. I take most of my photos in here because of the excellent lighting…and the metal grates I have at the window make such a pretty backdrop. My hydrangeas are just starting to bloom outside. These faux flowers were just the perk this space needed a couple of months ago, but soon they’ll be replaced with beautiful blooms from my garden! The Summer House sign below is a Pottery Barn knock off I made a year or so ago. I love it, even in the Winter! 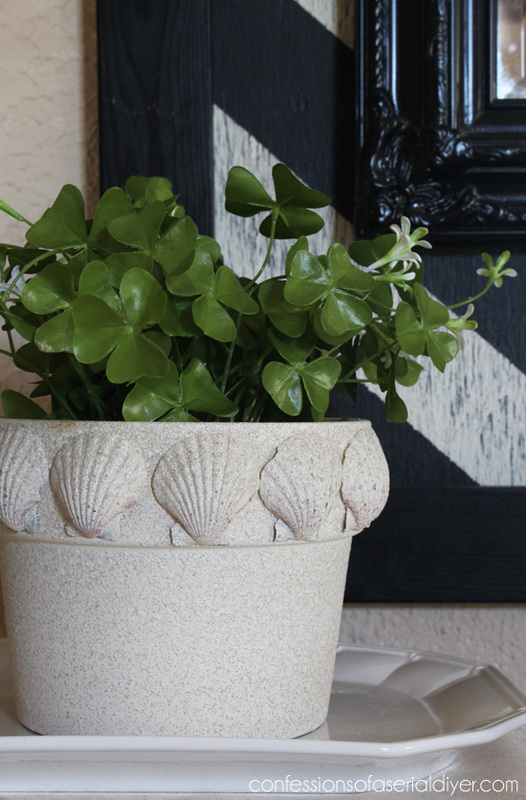 Summer décor to me means two things: seashells and hydrangeas. I may still have my faux hydrangeas in the dining room, but I was just barely able to pull this small arrangement together with what’s starting to bloom in my garden. I’m so excited they are finally beginning to bloom! Wait till you see what’s on the way…I’ll give you a peek at the end of the tour! My Dad was born and raised in Sydney, Australia and he loved to go diving. He amassed quite a collection of beautiful shells. Most of the shells I have on display are part of that collection. I treasure them! And if you turn around, you’ll see this! The Beach Cottage sign below was a freebie! I made it out of an old picket from my old gate. 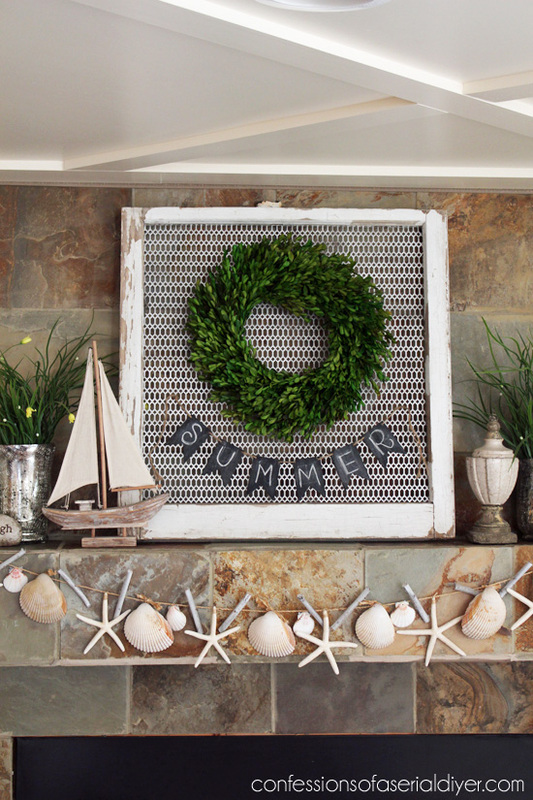 Nothing says Summer like a beach cottage! Life IS good at the beach! We live about a mile away from the beach and I really do love it. That would be my front door behind the stairs. The white door leads to the bathroom. I am loving my new hardwood floors! They have made such a difference in this entire space. See more on them HERE. Pretty pillows! Can I tell you how many times a day I fix these pillows?? My boys don’t throw them on the floor, they sit right on top of them. UPDATE: I made slipcovers for my sectional and what a difference! You can see them HERE! Can you see our water cooler in the background? I managed to show you all around that area and was able to keep that hidden. See how sneaky we bloggers can be hee hee. There’s no hiding it here! Let’s just look at the pretty pillows instead mkay? How about my new rug? Love! 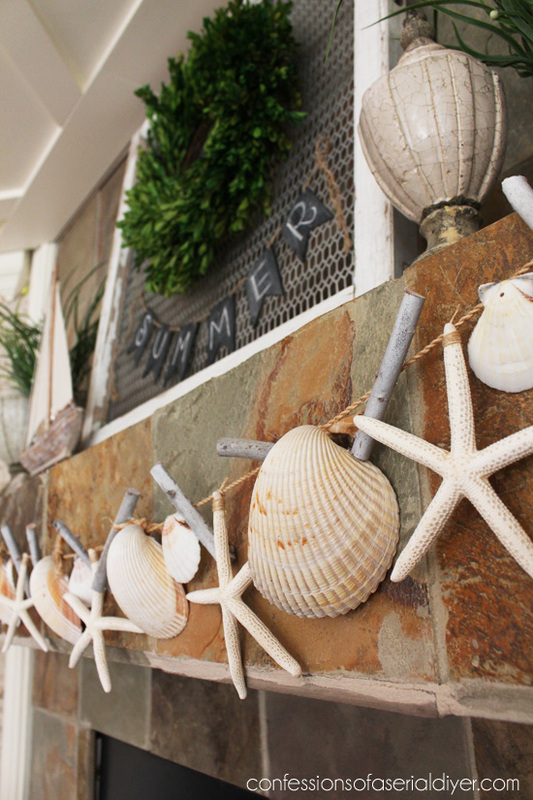 And there’s my shell garland I just shared recently! A couple of shells bring summer to this little area also. And that’s the Summer tour of our main living spaces! I’m so glad you stopped by…Come on, I’ll show you out. So. Many. Hydrangeas. I cannot wait! They are my very favorite flowers. I have four bushes here and four in the back yard. One of the back yard bushes was a gift from my Mother in law. It was a small cutting from a hydrangea bush that she had, that had come from her Grandmother’s hydrangea bush! How cool is that? It is growing beautifully and has several flowers on the way too. I hope you enjoyed my Summer Home Tour! Thanks so much for stopping by! 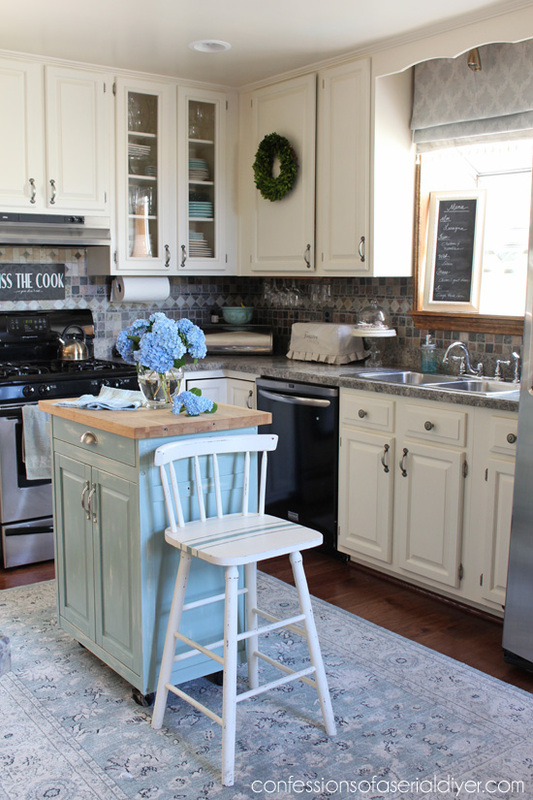 I am just one of 24 bloggers sharing their Summer spaces today! If you have a minute, you can visit their Summer spaces at the links below! This is going to be an amazing Summer! Beautiful home!!! Love everything in it.you have such a flair. I’m new to your blog thanks for the tour! Your house looks so pretty! Your staircase is really different and beautiful. You have a beautiful home Christy! Remember to take time to smell the roses (hydrangeas?)! I adore those flowers too!! I recently started following your blog and this morning was clicking through some of your older posts. The sectional makeover was incredible! You are my new hero! My family thought my pulling up the kitchen linoleum, sanding the sub flooring and painting a checkerboard was crazy…. Your home looks so pretty Christy!!! Love your new floors. You have definitely achieved the beach look!!! And your garden, wow. I can’t wait to see the hydrangeas in full bloom. Have a great day and go to the beach!!! Christy your home is beautiful! Aww thanks, Julie! You are so sweet! 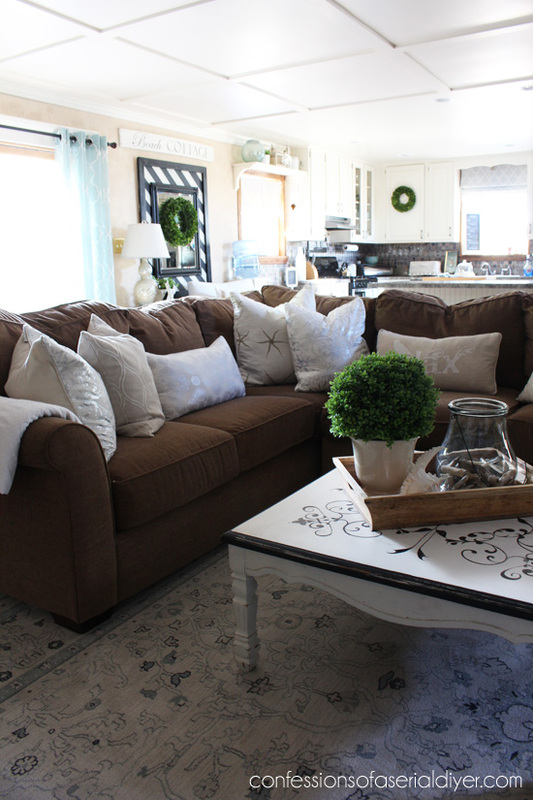 Christy, it was so fun seeing many of your DIY projects in their places in your home. We see your DIY creations but not always where they end up unless they to go to your shop. You are very talented and have a beautiful home. You are an inspiration. Thanks so much, Carole! I’m so excited to be able to share my space now that my ugly floors are gone! 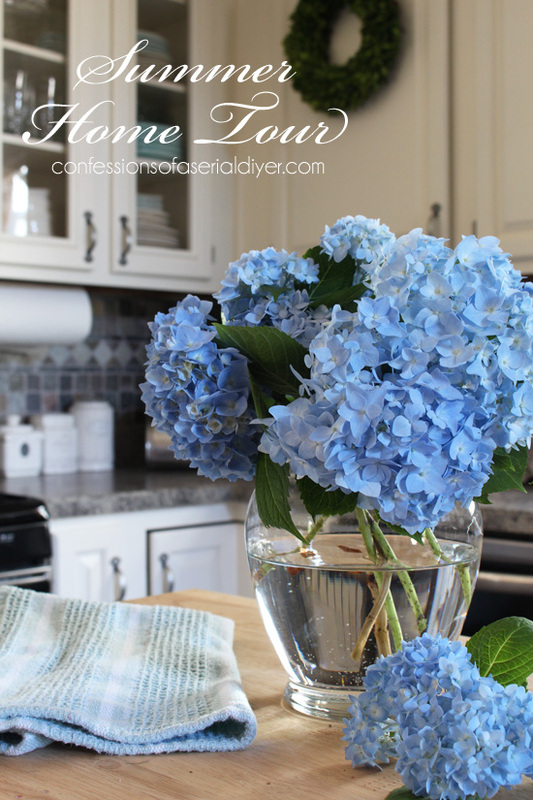 Your home is absolutely beautiful love all the hydrangeas..one of my favorites too!!! Everything looks so pretty Christy! Oh…and I didn’t even notice the water cooler til you mentioned it! 😉 Floors look amazing! What a difference they make! Your home is beautiful Christy! It was fun seeing all the projects you’ve posted over the years in their environment. 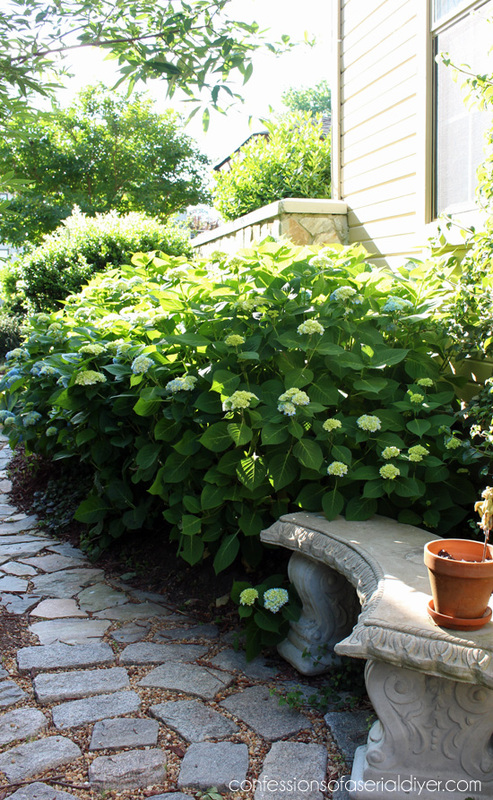 I’m green with envy that you have hydrangea’s – oh and that you live a mile from the beach. My one lonely hydrangea bush is pathetic and has yet to bloom (blaming it on living so close to the North Pole). 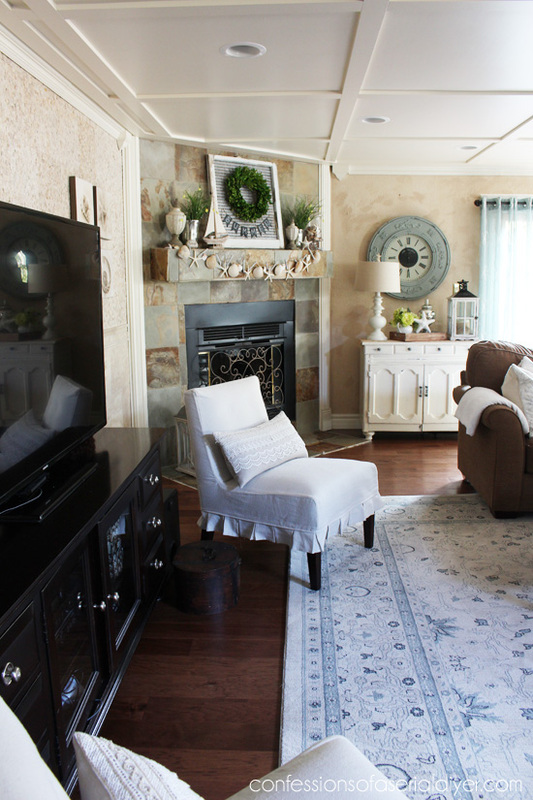 Christy, your home is so beautiful…I love your color palate and all of the special pieces shown throughout. 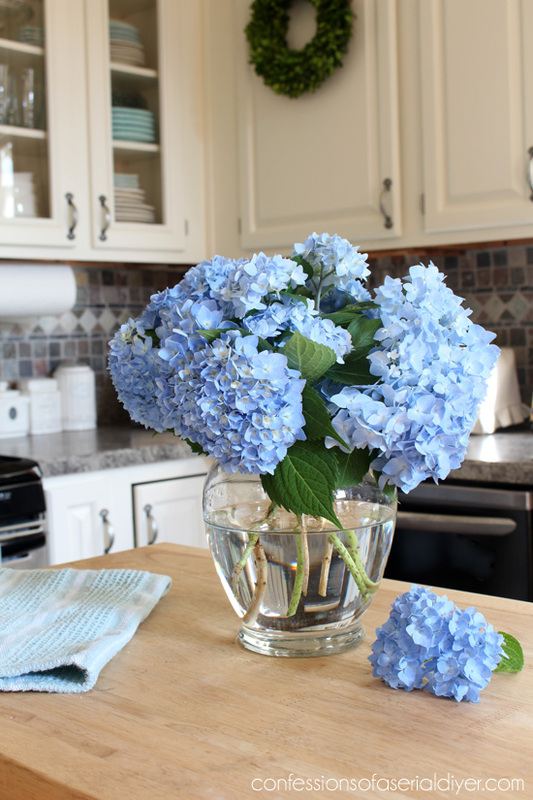 Mmm… I love hydrangeas! So jealous!! And I can see why you didn’t move the lantern – it’s perfect there. You have a lovely home, Christy! Oh Christy, your home is stunning and inviting. I love the open floor plan and all of your beach details. I like the lantern on your stairs. 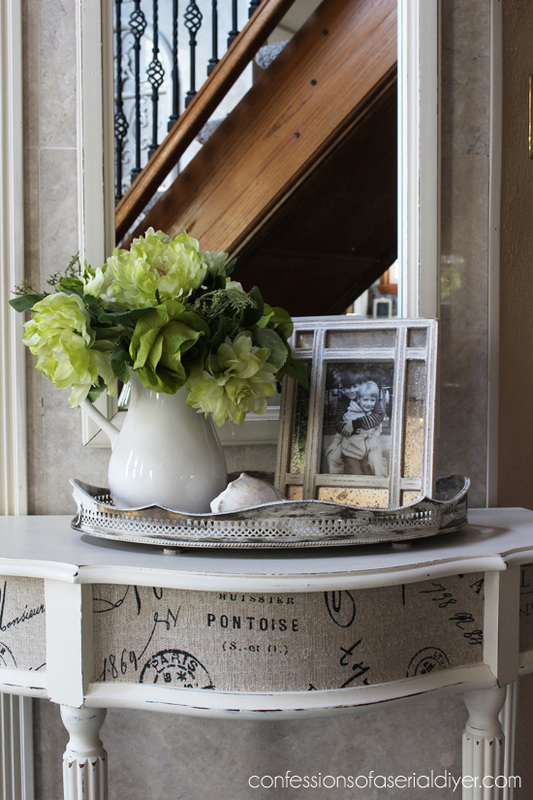 It is such a welcoming spot in your home. Thank you for sharing your home and inspiring me. 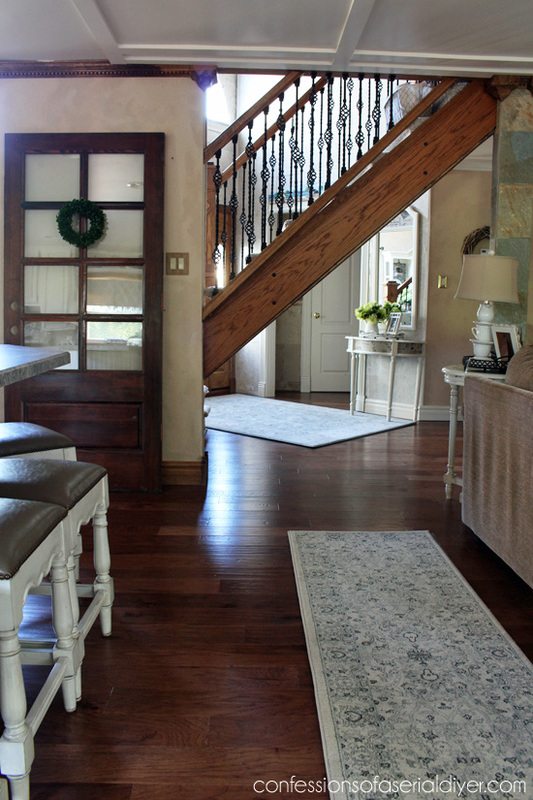 Thank you christy for sharing with us your personal and beautiful home . Absolutely gorgeous!! 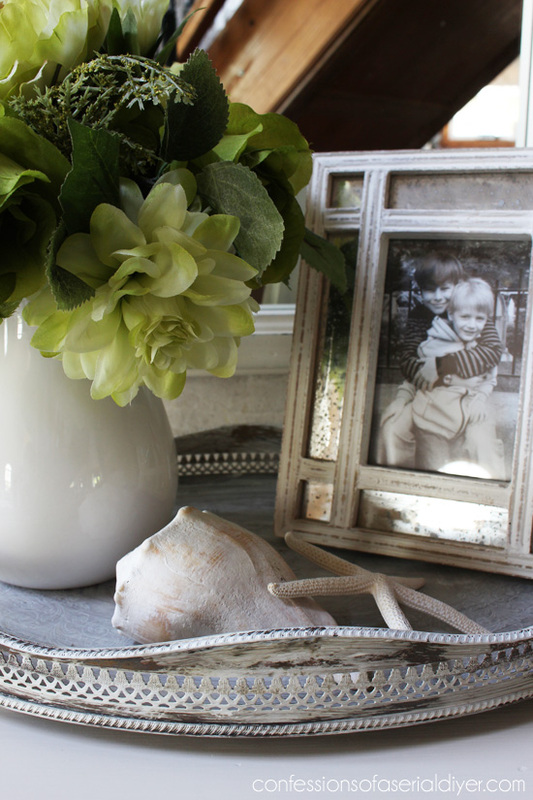 Love your beautiful Balsam Hill lanterns, and you lovely seashell garland. 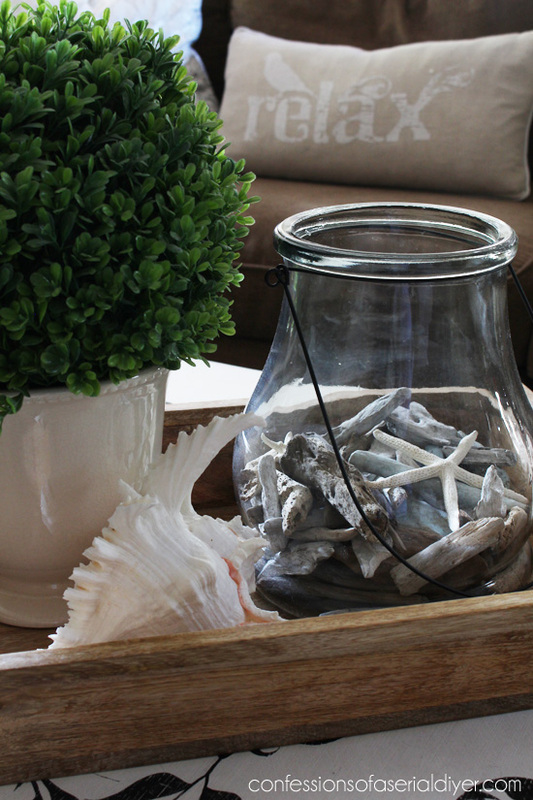 Your summer decor looks so nice and is just perfect for your coastal home. 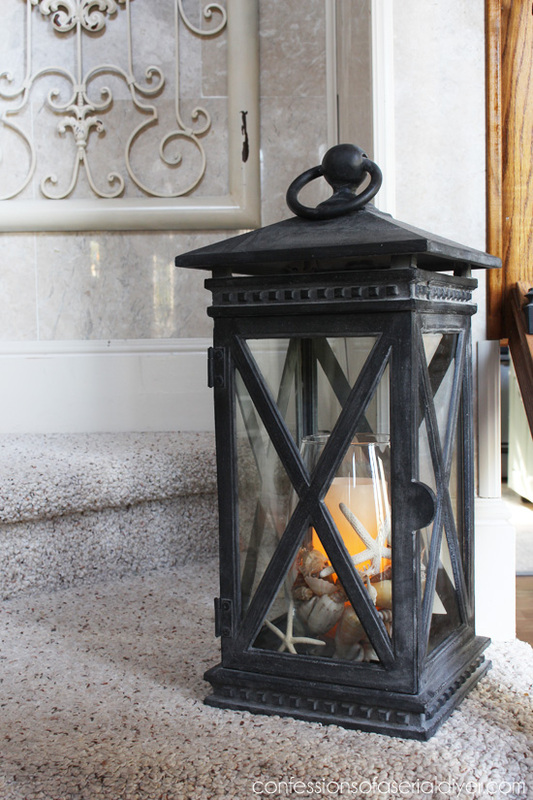 I like the way you styled your lantern and placed it on the steps so that it is the first thing that guests will see. Thank you for sharing your beautiful home. You are so talented and have accomplished making it comfortable and homey as well as decorated so lovely. I must admit I was waiting with anticipation for what was “coming” at the end of the tour and was thinking new baby! 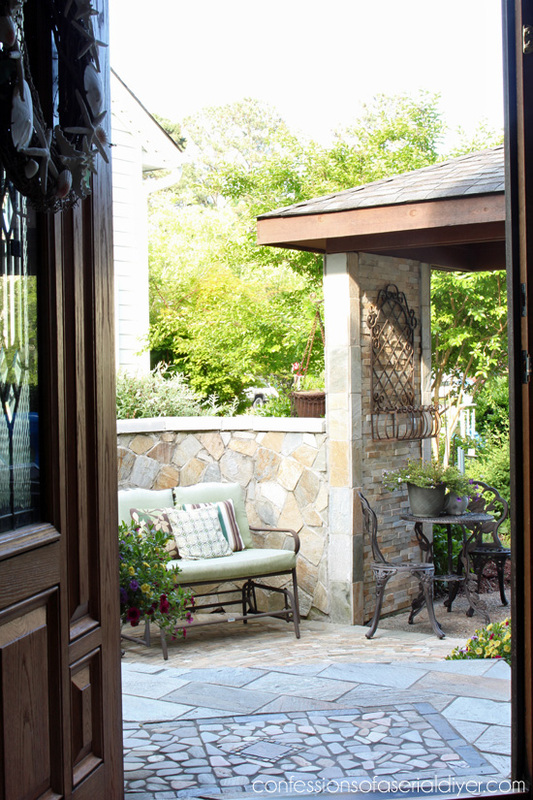 I’m drooling over your little courtyard – it’s gorgeous! WOW!!!! VERY nice!!!! LOVE-LOVE-LOVE it!!! WOW!!!! to the hydrangeas bushes. Love them and the color is awesome!!!! Your house is so coordinated too…very well done!!! It’s that unfair gene you’ve got!!! 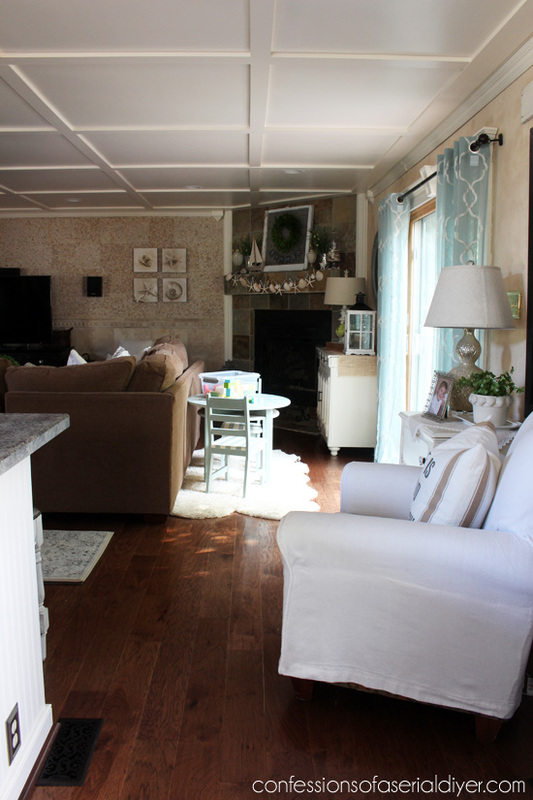 You have an absolutely gorgeous home, Christy, and I adore all your touches, including that new lantern. Well done!! 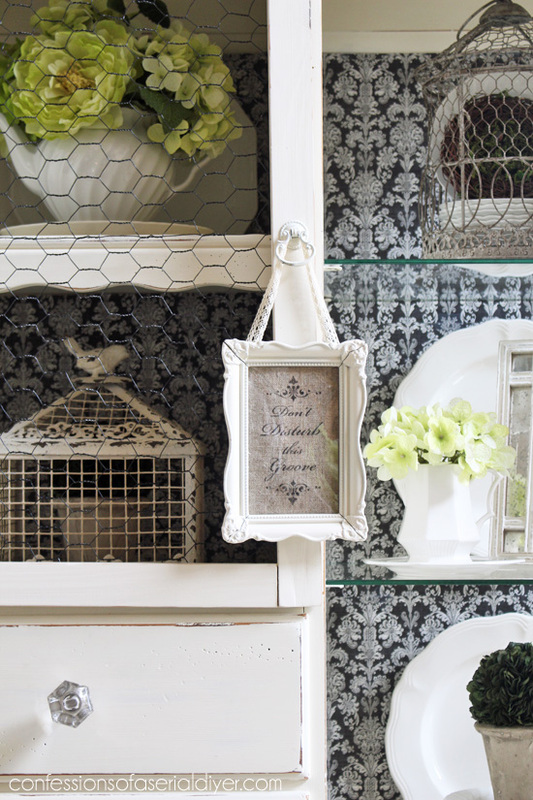 Love all your creative touches in your beautiful home! Thanks for the tour! 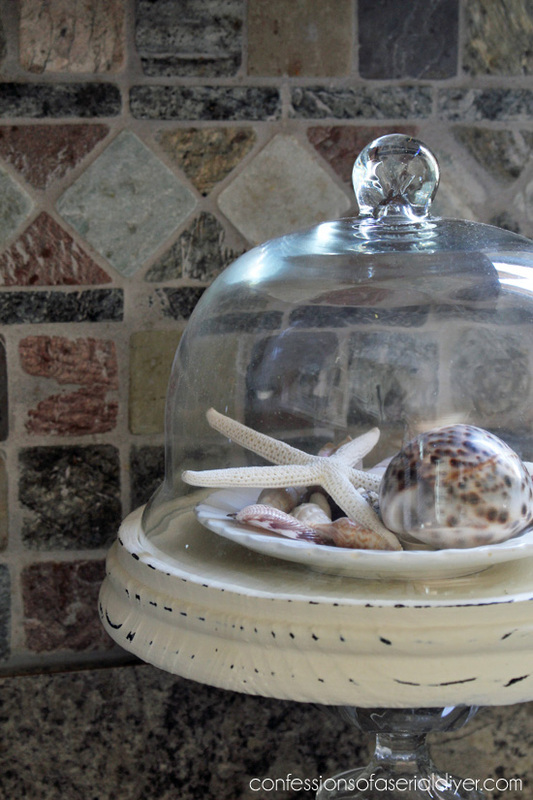 Living not too far away I also love all the seashells and your coastal style! Thanks, my friend! My desk was a mess ha ha and as for the recliner…if only I could just make it disappear lol! Beautiful, Christy!! Your home is so beautiful and inviting. 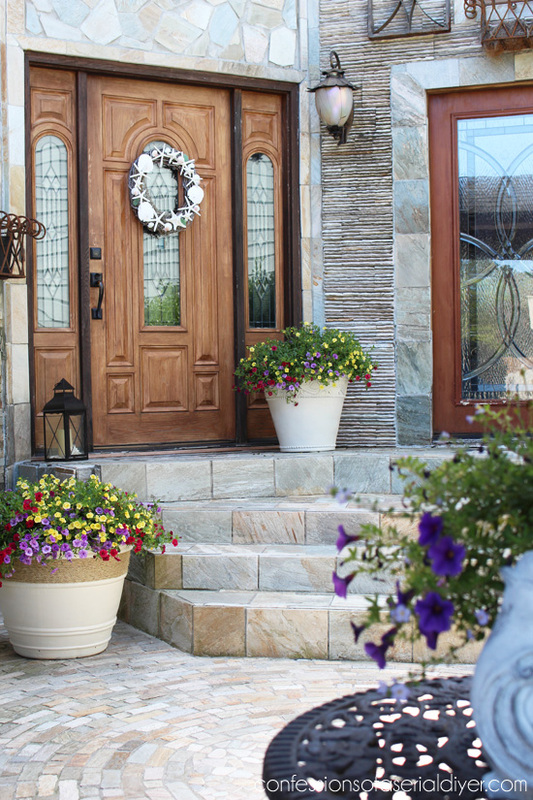 I love your outside entry, too — all those gorgeous hydrangeas — so jealous!! I LOVE your summer home tour! Hello again! I must make another comment….after looking at the pictures again, I was wondering, with the lack of interior walls did you find it to be challenging in decorating? I must say, “You NAILED it!!!! perfectly…..GORGEOUS!!! BEAUTIFUL!!!! Love the tour! Absolutely beautiful. Hydrangeas are my favorite, too. Mine are so close to blooming. I cannot wait. Question: where did you get the fireplace screen? I have been looking for one like it. Thanks, Teresa! The fireplace screen is probably 15 years old or so, I purchased it from Kirklands. Look at the place, so bright. I wonder how good it might feel to be there. 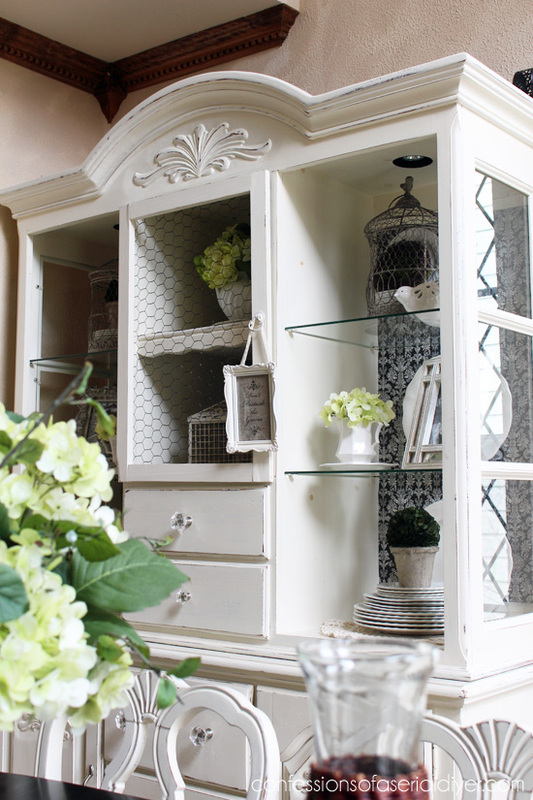 Really loved everything in your home and indeed it looks ready for summer. I like the outdoor area as well, generally we don’t them as clean as this. It’s such a lovely home, and I love how inviting the entrance is. Your home, inside and out, is absolutely beautiful, Christy. 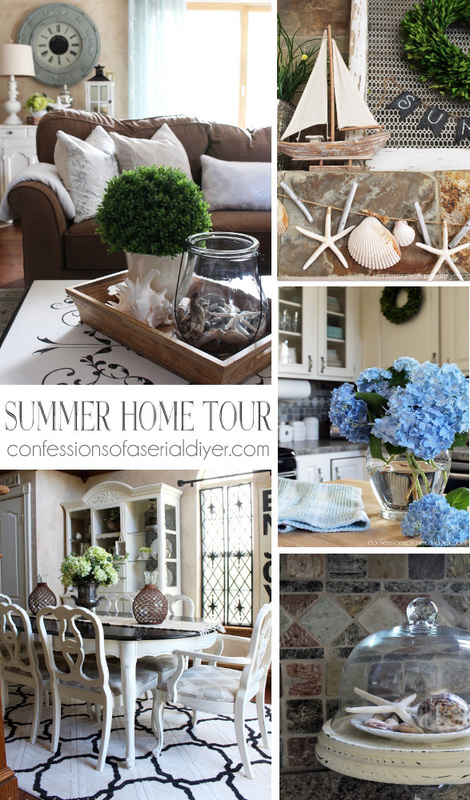 Thanks so much for sharing your summer home tour! Christy, the lantern additions are wonderful. It’s not overdone. So fun! Thanks you, Dagmar! The lantern is beautiful! 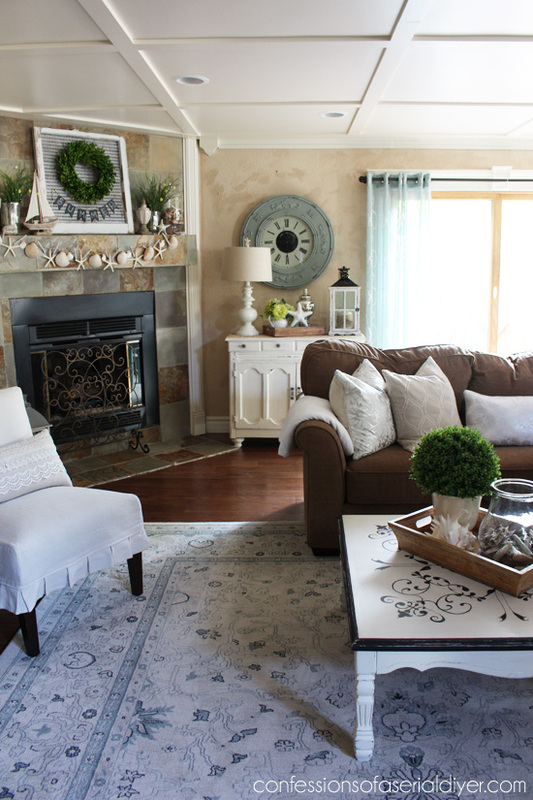 Your home looks truly gorgeous and classic, Kristy! 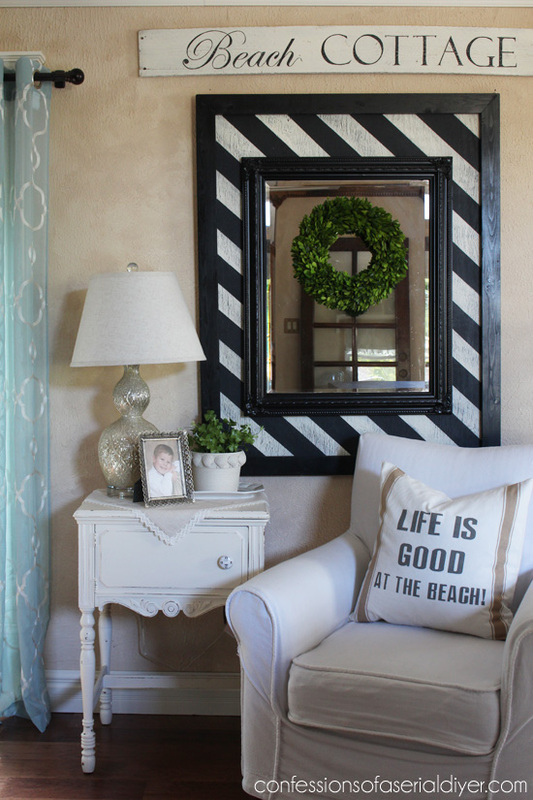 I love the coastal decor with boxwood greenery, and gorgeous painted furniture everywhere you look! 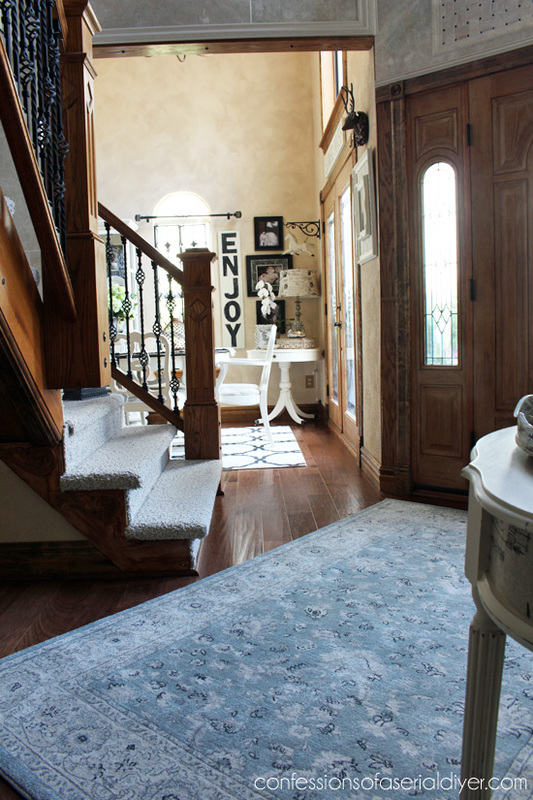 Your home is gorgeous, Christy! And yeah, it says Summer all around. Cant’ wait for my hydrangeas to flower, last year they didn’t, crossing my fingers. 🙂 Hey, the floors look fab too! Thanks so much, Cristina! Now if I could just come steal your driftwood crab lol…it would fit in perfectly in my house. I’ll cross my fingers too for your hydrangeas…frustrating to not be getting any blooms. I have a climbing hydrangea that was blooming when I bought it, but has never bloomed since! Beautiful Christy!! I LOVE the hardwood and new rug. 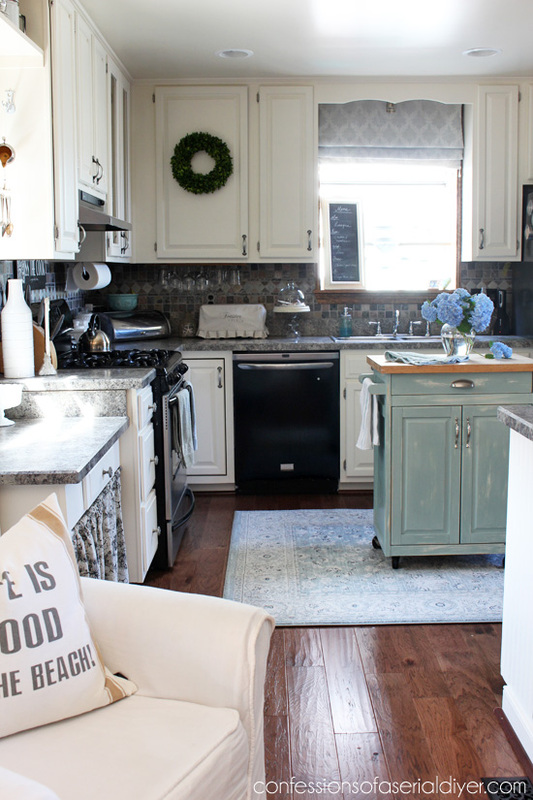 It looks so classic and light and bright with all your beachy touches. The garland is awesome!! Your home is so beautiful. And it looks perfect for Summer. So lovey! I love your mix of French and coastal style, Christy. those new floors are so amazing!! Thanks, Heather! I didn’t know you lived in Chesapeake? Oh darn! Would have been awesome to have you that close by! select plain colored upholstery for sofas or chairs instead of bold plaids, stripes, or prints. However if a person is looking for a one stop online solution for his tile buying need he can count on the site Mytilebacksplash. Hi! I love your decorating style. 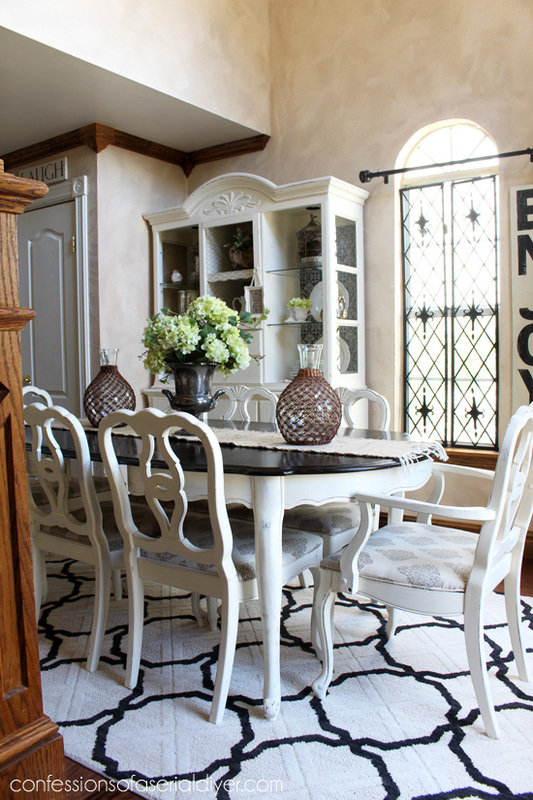 Where did you get your black and white rug for your dining area?? It might be navy and white…can’t tell from the pic…but it’s beautiful! Thanks!! I know I am late to the party here, but being new to your blog, I’m still reading up on posts when I have a chance to. I ADORE your bar stools and I spotted your toaster cover, probably the first one I have EVER liked. Sure would love to see a tutorial on that. Hydrangeas are my favorite too. I have several and they are just starting to ‘wake up’. I cant wait for them to bloom. Yours are gorgeous. Well whaddya know! I just found your tutorial for the toaster (oven). Yippee! Love everything about it! 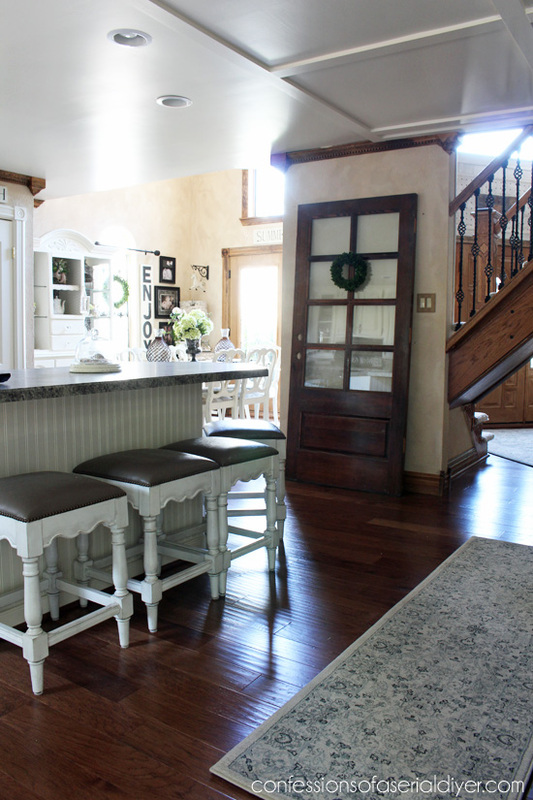 Love the island redo you did but I am really in love with the paint technique in the dining room. Could you tell me me how you did that? Thanks, Jen! My Hubby did that by adding texture to paint with something called paint texture, I believe. Then he rolled it on with a really bumpy roller.